Shinano Mainichi Shimbun published an article about Jigen no Hashi Project (じげんの橋プロジェクト), a fan-led initiative in Chino, Nagano Prefecture that provides guidance on locations used in the Saki series and promotes local food businesses. The Project was formed in 2018 December in response to the dissolution of the Chino Tourism Association, which had offered seichijunrei tours. Fuji News Network published an article, essentially an interview with contents tourism researcher Okamoto Takeshi (岡本健), exploring the origins and development of seichijunrei broadly, and recent growth in interest among foreign visitors specifically. The key point Okamoto makes is that though in Japan there is clear differentiation between traditional tourism and pop culture tourism, foreign tourists generally don’t make as strong a distinction. Thus there are opportunities to use one type as a trigger for interest in the other, and vice versa. A revised edition of Contents Tourism Research (コンテンツツーリズム研究) by Okamoto Takeshi, originally published in 2015, will be released by Fukumura Shuppan on April 11. Buzzap published an article about interest among Chinese tourists in what are called “cold gates” (冷門), which in this context are locations away from heavily trafficked tourism routes that offer interesting local culture, using the case study of the Tamako Market, Uchōten Kazoku and K-On! settings and shōtengai in Demachi, Kyoto. 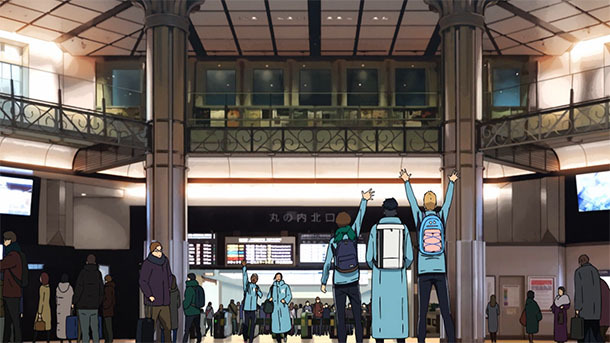 Nico Nico News published an article highlighting recent content on Chinese news platform Toutiao that explains the premise of anime and manga seichijunrei and notes its increasing popularity among Chinese tourists visiting Japan. Walker Plus published articles introducing Zombie Land Saga locations in Saga City, Karatsu and Ureshino, Saga Prefecture. @teo_imperial made a pilgrimage to Gotanda, Ebisu and Ōtsuka (all Tokyo inner wards) for BanG Dream! @flyingbird1124 made a pilgrimage (updated post) to Nerima Ward, Tokyo Metropolis for Domestic na Kanojo through Episode 10. @flyingbird1124 made a pilgrimage to Machida, Tokyo Metropolis for Date A Live III OP. @flyingbird1124 made a pilgrimage to Machida, Tokyo Metropolis for Circlet Princess. @rica0867 made a pilgrimage to Gobō, Mihama and Wakayama City, Wakayama Prefecture for Eiga Chūnibyō demo Koi ga Shitai! Take On Me. @yomikayajiyu made a pilgrimage (post 3) to Chōshi, Chiba Prefecture for Amagami SS.